Introducing strange Chins to each other or adding a new Chin to an existing group can be quite problematic at times. Chins recognize each other by odour and often do not readily accept strangers. However,with patience and careful attention to proper introductory techniques, it is possible to have most Chins accept each other. Naturally, due to distinctive personality [should that be "animality" or "Chin-ality" ?] differences, there will always be some Chins [and animals] that will simply remain incompatible. On average, male Chins are distinctly more compatible than female Chins under common-sense situations. [For example, 2 adult males with one adult female is just asking for trouble.] It is a myth that male Chins can not get along. The myth originates from applying the behaviour of other animals and is simply not applicable to Chins. One should take a black marker and cross out the references to male incompatibilty in the Chin books. They are simply wrong in this specific instance. It is often the case that the author has little or no experience with Chins and was simply extrapolating from other species. However, even this reasoning is suspect because iso-sexual ["same gender"] pairs and trios can be readily established in many other species including Degus, Sugar Gliders, Gerbils, Deer Mice, Humans, etc. We don't recommend introducing another Chin to any female Chin that still has young unweaned kits with her or is about to deliver: she will be over-protective. With respect to having the females' cage near the males, opinions will vary. However, we have numerous all-female cages next to all-male cages over the years with no problems among the males. The more closely related the two Chins are, the easier it is to put them together. The shorter the period of separation [if they were together earlier such as father-son, mother-daughter, brothers, sisters, etc], the less the need for a gradual re-introduction. The younger the Chins involved are, the easier it is to pair them: this works particularly well with, for example, 4-month old juvenile Chins. In general, female-female pairings are the most difficult to establish and male-male pairings and groups are the easiest while male-female pairings are somewhere in between. In many cases, two Chins can simply be plunked together in NEUTRAL territory and allowed to run together: they will get along in fairly short order. However, it is recommended that such rapid introductions be performed only by those very experienced with Chins and highly attuned to imminent adverse behavioural reactions. For most pet owners, we recommend employing one of the following methods of acclimatizing Chins to each other's odour: the "cage-in-a-cage", the "close-confinement", and the "side-by-side-cage" methods. The "cage-in-a-cage" method involves placing a Chin in a small cage which is placed inside the larger cage of the other Chin for several days. If one or the other Chin remains aggressive when they are allowed to run together in NEUTRAL territory, then the aggressive Chin is placed into the smaller cage and the procedure is repeated for another few days, and so on. One should also transfer some bedding material between the two cages on a daily basis to facilitate odour transfer. The "close-confinement" method involves placing both Chins into a cage that is so small that they cannot move or walk around without touching and smelling each other. The close quarters will also physically prevent serious conflict. At the same time, their odours can be masked by liberally spreading talcum powder or baby powder throughout the fur of both and/or dabbing a little Vick's Vapo-Rub, Eucalyptus oil, or men's cologne on their noses. Because the odour will slowly fade away, the "nose fingerprint" of each Chin will be gradually revealed. Our preference is for the "side-by-side-cage" method which involves placing the Chins into two regular cages next to each other. We recommend maintaining a 1 cm space between the cages to lessen the danger of toes being nipped off. As with method # 1, some bedding material and furniture should be transfered between the two cages on a daily basis to facilitate odour transfer. In general, regardless of which of the above methods is employed, the Chins will most likely be ready to be introduced to each other when they no longer attempt to "get at" each other through the bars but rather simply ignore each other or try to huddle close to each other. Once the above has occurred [it may take days, weeks or even months] , it is wise to have the initial meeting as a joint romp in NEUTRAL territory outside the cages rather than being placed together in one of their cages. Masking the odour by liberally spreading talcum powder or baby powder throughout the fur also facilitates such introductions. One can also dab a little Vick's Vapo-Rub, Eucalyptus oil, or men's cologne on the noses of both Chins to enhance the odour-masking effect. Above all, keep a sharp eye out for serious fighting. Minor tussling and short chases are normal during the first few hours. The most important caveat here is the need to exercise PATIENCE and to make the introduction process as GRADUAL as necessary. Never try to rush the process or force them together. If incompatibilities arise, go back a step or two and repeat the process. Think in terms of weeks [or even months] rather than days when evaluating the success of the introductory process. Usually it is the failure to adhere to this that causes most introductions to fail. The above principles apply to female-female and male-female pairings as well. The age difference is not really a significant factor [although the female should be mature enough for breeding]. The real question will be how accepting the female will be. It is quite possible to have one male with two [or more] females as long as the females are compatible. If the males and the females are strangers to each other, then it is often better to keep the male away completely and try to get the females together first. If a new female is being introduced to an existing male-female pair, you will need to do some juggling. One method would be to introduce the male to the new female, and switch him between two adjascent cages each day. When you think the two females are ready [ie., a couple weeks later] , mask their odours and release them into NEUTRAL territory. It is probably better to have the male out there with them at the same time: he will provide some necessary distraction. Short conflicts may arise periodically in these small groups and is often a result of a dominant female reacting to estrous cycling in a subordinate. In such situations, the conflict will likely persist for about a week and may necessitate one of the individuals [ie., the dominant female] being removed for that time period. If serious conflicts persist among the remaining individuals, then there is the possibility of the victim being a "learned victim" as discussed below in "Persistent Victims" . Definitely NOT recommended. Putting two adult males with one adult female is just asking for trouble. Chances of success, while still very good, will not be quite a high as for male-male pairs/groups or male-female pairs. It is also quite possible for the pairing/grouping to disintegrate [either temporarily or permanently] when one of them undergoes an estrous cycle. The process of putting two [or more] males together is basically the same as for creating a male-female pair. With respect to having the females' cage near the males, opinions will vary. However, I have numerous all-female cages next to all-male cages with no problems among the males. It is possible to eventually get 4 Chins together. Use the gradual introduction approach that you would use for putting any two Chins together. A major advantage would be if all of the Chins are still relatively young. You can take several approaches for the initial run together in NEUTRAL territory. One is to simply "dump" all 4 together in neutral territory but one shouldn't be too sanguine about achieving success. 1a and 2b followed by 1b and 2a. Keep switching in this fashion from session to session. Hope this makes sense. Integrating two colonies will not be easily accomplished and one should be somewhat pessimistic about achieving complete success. Essentially, you will be causing the established dominance hierarchies to be re-ordered and this will require considerable "negotiation" by the Chins involved. One method is to rotate the two colonies between two adjascent cages for several weeks. However, this may not be sufficient to permit re-adjustment of the respective dominance hierarchies. An alternative strategy is to use a third or even a fourth cage [keep all the cages beside each other] and mix some individuals from each colony into the extra cage(s). One would then rotate individuals through the extra cage(s) on a daily or semi-daily basis, However, with larger colonies, more cages may be required as the permutations become considerably more numerous. This integration may take only one day OR several weeks OR many months OR NEVER. The greatest potential limitation is if several males and females are involved: there will most likely be consequent disputes over mating "access". There are several situations in which a male Chin may be separated from his female mate and many owners worry about potential problems when they are re-united. The post-partum estrous period in female Chins is generally 24-72 hours in duration and begins as soon as the kits are born. To avoid immediate re-impregnation [aka "breedback"], many breeders remove the male for about a week, just to be on the safe side. Avoidance of breedback should be a consideration when the female has had several litters in succession or appears a bit "run down". In the latter case, the female may not [but not always] permit another pregnancy anyways [if she has sufficient space to avoid being "trapped" by the male]. Male Chins make very good parents and should play a role in raising the kits, even during his week of enforced separation. You can put the male Chin in with his kits anytime. If you put the male in with his kits and at the same time permit the female to run about the room [to give her a break from the kits] for up to an hour, you will likely discover that the male will be a lot less persistent upon her return. Hopefully, he will continue to huddle with the kits! If it doesn't work, remove him and try it again each day. In the unlikely event the female becomes/stays quite aggressive, then you might have to keep the male away for another week or so. Overall, there are usually few problems with returning the male once the female's post-partum estrous period has concluded or even for longer periods of separation [ie., weeks, months] . In a group that has been together peacefully for a while, sometimes the stability in social ranking among the individuals will be disturbed by some unusual event or disintegrate "spontaneously". We have encountered this on occasion among Deermice, Gerbils, Degus and Chins. Everything may be fine for months or even years and then, for no apparent reason, vicious fighting breaks out. When the victim is returned after several weeks, etc, the fighting re-erupts. One, albeit controversial, theory regarding this phenonmenon emerges from human psychological studies. Specifically, it concerns victims of bullying in schools [and workplaces, as well]. It has been observed that some individuals are always picked upon, even if they switch classrooms, schools, or even towns. Furthermore, their siblings are also picked upon in a similar manner. It has become apparent in these situations that the victims have acquired a set of behavioural traits and reactions [learned or otherwise] that are [usually unconsciously] perceived as "weakness" on the part of the bullies [and even by normally well-behaved individuals] and seem to encourage further attacks. These individuals tend to become hyper-sensitive in relatively innocuous situations and over-react, thereby perpetuating the cycle. Thus, they have become "learned victims". Successful intervention in this victimization cycle usually involves teaching the victims pro-active assertive behavioural patterns, and appropriate social skills in addition to boosting their self-confidence. How does this relate to animals? Well, victims tend to be hyper-sensitive, and react in a defensive manner [ie., vocalizations, scurrying away, and later complete submissiveness, etc] that only seems to encourage further attacks. For example, have you ever noticed that some dogs will chase a running cat but not a stationary one? Among Chins, mild cases manifest themselves as gradual weight loss by subordinates and the provision of extra food bowls helps. In more serious cases, the victim will receive physical injuries and may in fact eventually be killed or die from stress. One solution is to raise the victim separately for several months with the owner acting as a "surrogate" parent. The extra attention and the passage of time should bring about dramatic improvements in the victim's self-confidence and assertiveness. In many ways, fostering kits to a foster mother is similar to introducing two strange Chins. In this case, there is potential for the foster mother to reject the new kits and to either neglect them or direct aggression towards them. The key to successful integration is to mask the odours of the kits by applying some perfume, etc as discussed above in "The Initial Introduction" to the derrieres of the kits and the nose of the foster mother. It also helps to rub talcum or baby powder throughout the fur of the kits. There are some time boundaries to observe when fostering kits. Specifically, the kit(s) of the foster mother should be within one week [two at most] of age of the kits to be fostered. If the age difference is much greater, the younger kits will be at a disadvantage in establishing their position in the social hierarchy. ChinMania welcomes other language translations of this article. 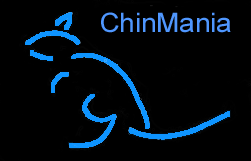 Please be sure to contact ChinMania at either ChinMania@gmail.com or ChinMania@gmail.com FIRST before you publish it.